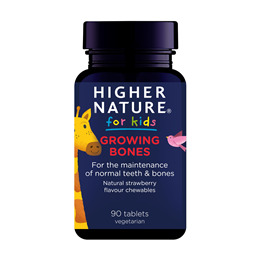 These tasty, strawberry chewable tablets are great support for your growing little ones. With calcium, magnesium and vitamin D3, for the maintenance of normal bones and teeth. What’s more these tablets are dairy free! Sweetener: sorbitol; lithothamnion calcarea, magnesium citrate (magnesium oxide); natural flavouring (juice concentrates), flavouring: natural blackcurrant (anticaking agent: silicon dioxide); acidity regulator: citric acid; colour: beetroot powder (acidity regulator: citric acid); anti-caking agent: stearic acid; anti-caking agent: silicon dioxide; anti-caking agent: magnesium stearate; cholecalciferol (vitamin D3) (emulsifier: acacia gum; anti-caking agent: tricalcium phosphate; antioxidant: dl-alpha tocopherol). Children over 3 years chew one tablet a day with a meal or as your health professional advises. For children aged 3 and above. Excessive consumption may produce laxative effect. 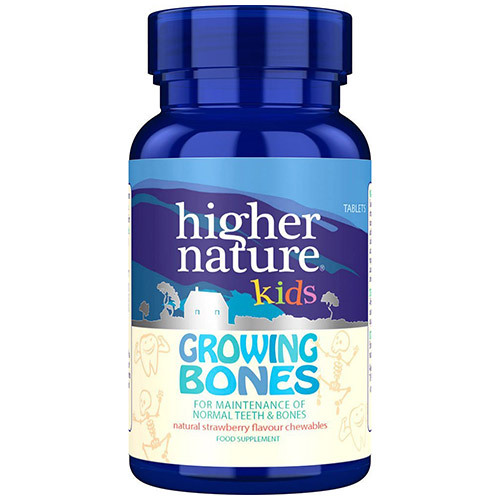 Below are reviews of Higher Nature Kids Growing Bones - 90 Tablets by bodykind customers. If you have tried this product we'd love to hear what you think so please leave a review.